The UK's Shadow Foreign Affairs Minister, Kerry McCarthy MP (Labour Party) has raised questions with the UK government regarding the recent imprisonment of Thai journalist and trade unionist, Somyot Pruksakasemsuk. Somyot, the editor of the "Voice of Taksin" magazine received a 10year prison sentence from a Bangkok court last week for the crime of "lese majeste" - or defaming the monarchy - in relation to two articles that appeared in his publication. The sentencing, while extremely draconian, was also controversial as the articles in question didn't actually contain direct references to the Thai monarchy but made allegorical and fictional representations which the court then determined were defamations. An international campaign, involving trade unions and other activists to free Somyot is now emerging. Before sentencing the UK's Trade Union Congress General Secretary, Frances O'Grady, also raised concerns regarding Somyot's prosecution. To ask the Secretary of State for Foreign and Commonwealth Affairs what reports he has received on the trial and conviction of Somyot Prueksakasemsuk in Thailand under that country's lèse majesté laws; and what recent representations he has made to the Thai government to support the promotion of human rights in that country. Our embassy in Bangkok has been following closely the case of Somyot Prueksakasemsuk. Three representatives of the embassy attended the trial on 23 January, and the embassy subsequently reported details of the outcome to me. 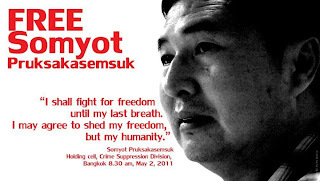 Following the verdict, the European Union issued a statement expressing deep concern at the decision to sentence Somyot to 10 years imprisonment. The statement noted that the verdict seriously undermined the right to freedom of expression and press freedom. Our ambassador has also raised the issue with the Thai authorities. The Government frequently raises human rights concerns with Thailand, both at ministerial and official level. For example, the then Minister of State, Mr Browne, raised human rights issues when he met Deputy Prime Minister Chalerm Yubamrung during his visit to Thailand in July 2012. That discussion included an exchange of views on lèse majesté. To ask the Secretary of State for Foreign and Commonwealth Affairs pursuant to the answer of 21 May 2012, Official Report, column 454W, on Thailand, what recent representations he has made to the government of Thailand in support of freedom of expression and reform of the lèse-majesté laws. The Government frequently raises the issues of freedom of expression and the lèse-majesté law with Thai interlocutors, both at ministerial and official level. The then Minister of State, Mr Browne, raised lèse-majesté among other human rights issues when he met Deputy Prime Minister Chalerm Yubamrung during his visit to Thailand in July 2012.